Macaron is the most popular and world’s toughest dessert. 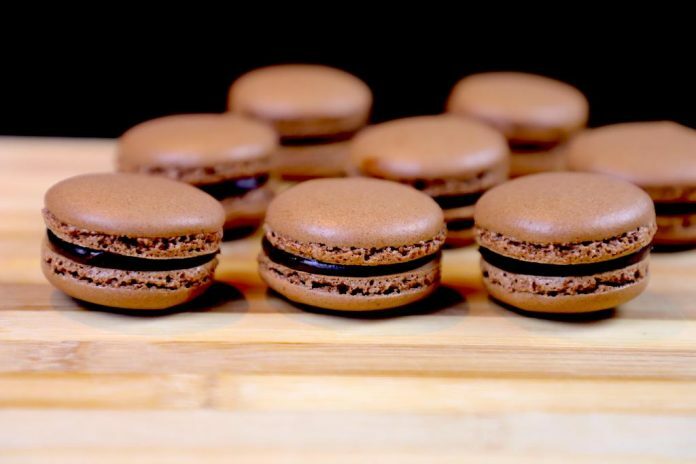 It’s a french dessert which is very popular all around the world and it’s quite expensive too, so for me it was an achievement when I made the perfect macarons. 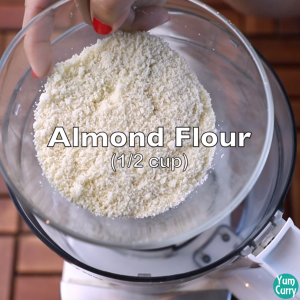 Now I know the reason of the expensive macarons, as it’s quite difficult to make them and the recipe demands almond flour which is comparatively expensive than the flour. Can we make it eggless? 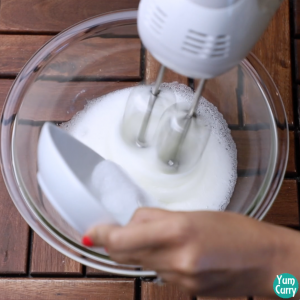 The actual recipe requires egg whites as they are the main ingredient for adding air to the macarons, but I heard that you can make it eggless using aquafaba. 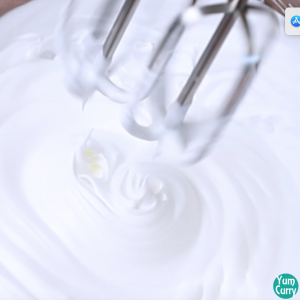 Aquafaba is made from chickpeas. 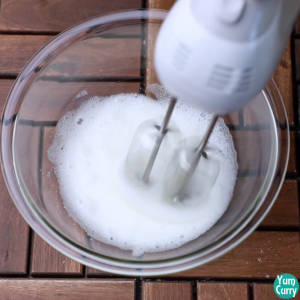 I have never used aquafaba but I heard people can easily make macarons using it. I will definitely try to use it in near future. Can we change the filling? 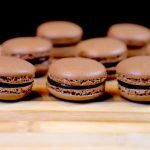 In this recipe I have made chocolate macarons, but there are several kinds of macarons available in the market. For chocolate macaron I have made chocolate ganache for the filling. For pink macarons you can use cream and berry flavoured filling or lemon flavoured filling. 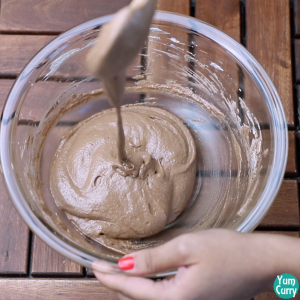 If you are not sure how to make macarons or you have tried macarons many times but failed all the times, this is the perfect recipe for you. 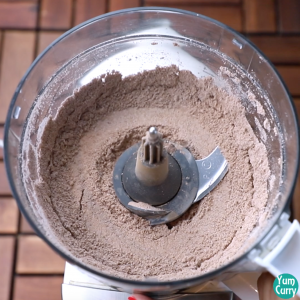 I have tried macarons 2 times before this recipe but failed, so I know the mistakes you have to avoid while making macarons. First mistake I made was I was not prepared before for each step, for example I did not prepared the pipping or pastry bag and baking sheet ready before, so when my macaron batter was ready, I was busy in preparing the pipping bag and making circles on sheet while my batter was sitting for 30 minutes. Second mistake was I did not had enough patience to leave the macarons to dry before transferring it to oven which resulted in bad shaped and bad macarons. 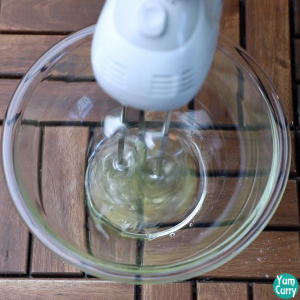 So I suggest you to follow this recipe step by step exactly to get the fool proof and perfect french macarons. 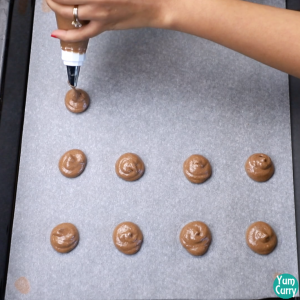 Prepare a baking tray by placing a parchment paper on it. Make small circles of approximately 1 inch all over the sheet. Leave a little space between the circles. 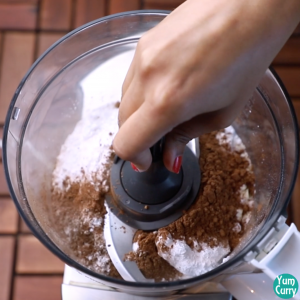 Take almond flour, powdered sugar and cocoa powder in a food processor. 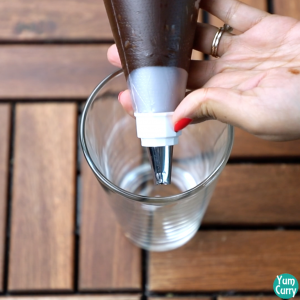 Food process it for 1-2 minutes. 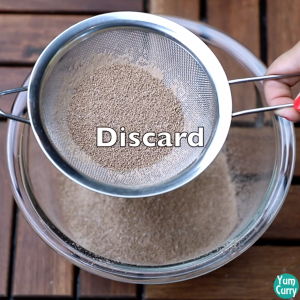 Sieve the mixture using a sieve and discard the residue. 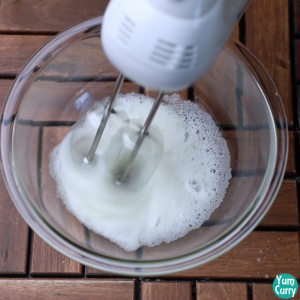 Take room temperature egg whites in a bowl. 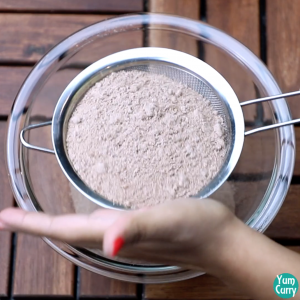 Add a pinch of salt to it and start beating it using an electric beater. 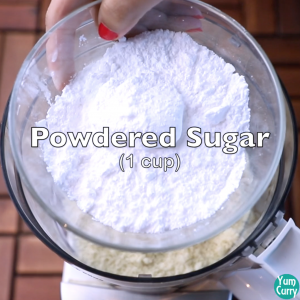 Now start adding sugar to it, little at a time. Beat it until stiff peaks formed. 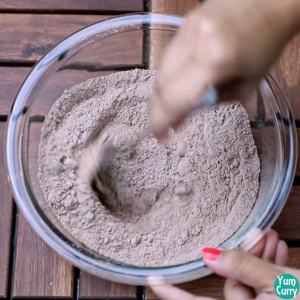 Add the dry ingredients into it, little portion at a time and fold it gently into the eggs using a spatula. Do not over mix it. 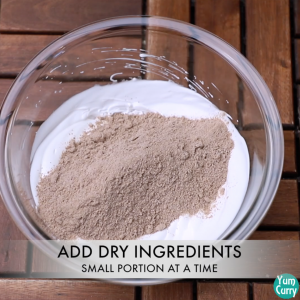 When all the dry ingredients are mixed, transfer it into a piping bag with a big nozzle. Now fill in the circles made on the parchment paper by putting pipping bag close to the circle. 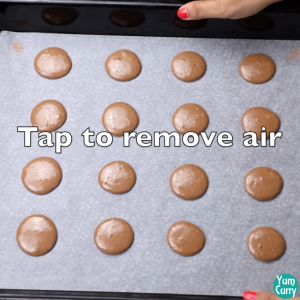 When done, tap the baking tray on the counter for 3-4 times so as to remove the air. Leave it for 30 minutes. 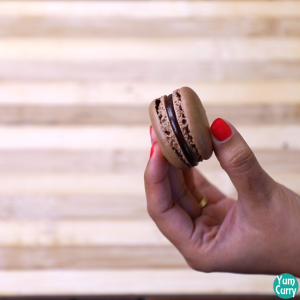 Check the macaron using a finger whether it has dried fully or not. If it comes on your finger, let it dry for some more time. Bake them in a preheated oven at 163°C/325°F for 13 minutes or until done. 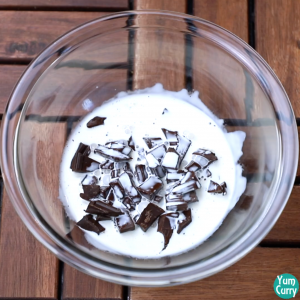 Heat heavy cream or whipping cream in a pan until little bubbles starts to come on the side (do not boil). 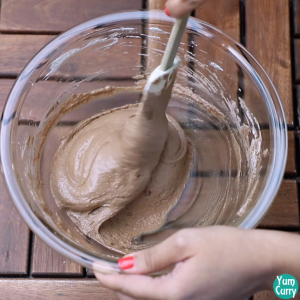 Transfer it to a bowl filled with roughly chopped chocolates/chocolate chips. 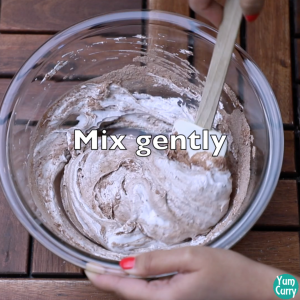 Mix it until chocolate melts and combines completely. 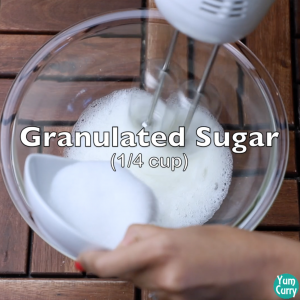 Place the bowl into the refrigerator for 10-15 minutes or until it becomes little thick. 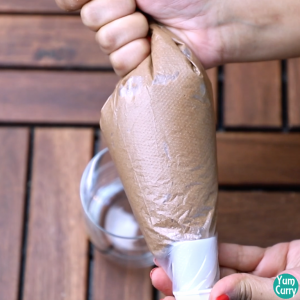 Transfer the thick chocolate mixture to a pipping bag with big nozzle. 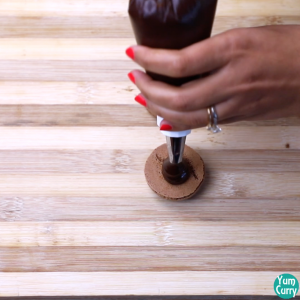 Take a macaron and add the chocolate filling to it, as much as you want. 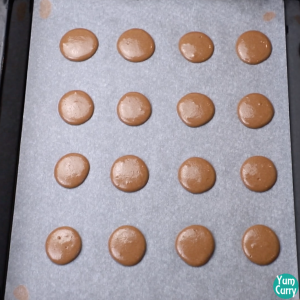 Place another macaron on it and press a little so as to equally distribute the filling. Prepare all the macarons. 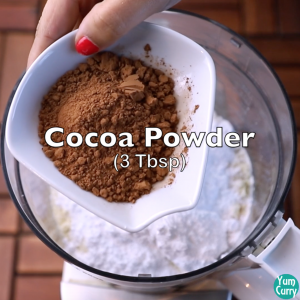 Take almond flour, powdered sugar and cocoa powder in a food processor. 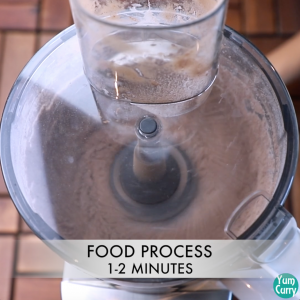 Food process it for 1-2 minutes. 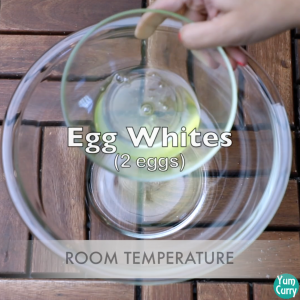 Take room temperature egg whites in a bowl. 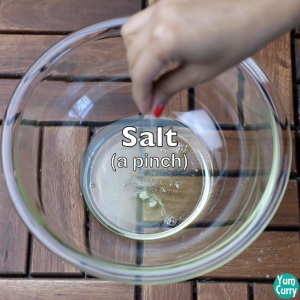 Add a pinch of salt to it and start beating it using an electric beater. 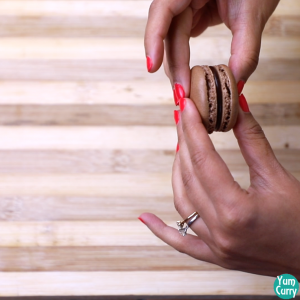 Check the macaron using a finger whether it has dried fully or not. If it comes on your finger, let it dry for some more time. 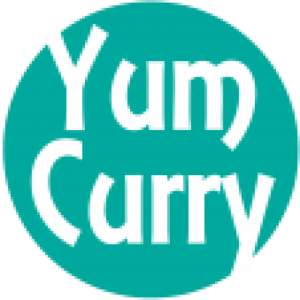 Bake them in a preheated oven at 163°C/325°F for 13 minutes or until done. 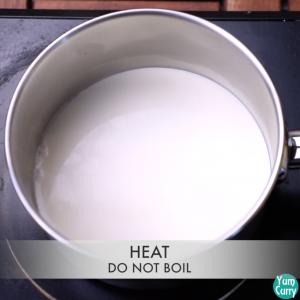 For filling, heat heavy cream or whipping cream in a pan until little bubbles starts to come on the side (do not boil). 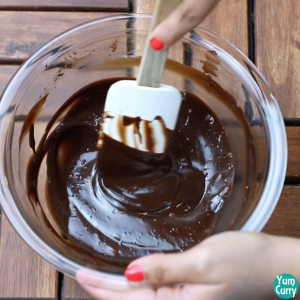 Transfer it to a bowl filled with roughly chopped chocolates/chocolate chips.